Getting work on the website can be done in a number of ways. Live notifications regarding projects and contests related to your added skills will be pushed to you via the Project Feed. It is located on the top right part of your Dashboard, above your chats. You have the option to choose between working on projects or contests on Freelancer.com. While usually awarded to a single freelancer, projects can be worked on by several freelancers, depending on the demands of the task. Employers get to choose whom to hire for their project, basing on the freelancer’s experience or previous work samples. Contests are based on a brief by the contest holder. Freelancers get to submit entries and actually show what they are capable of. The chosen entry receives the prize money. Now that your account is set up, you can start bidding on projects. Look for a project that you wish to work on, and click on Bid on This Project after thoroughly reading its description. Fixed-price project. Enter an amount you wish to be paid for delivering the output and completing the project. Hourly project. Enter the hourly payment that you wish to receive for the duration of the project. Indicate how many days it will take you to deliver, and click Place Bid. Compose a detailed proposal. Include your experience, credentials, portfolio, etc. Click Finish. The employer will review the bids they received and contact freelancers to further discuss the project. Take advantage of this opportunity to clarify the scope and the details of the project, and to request for the creation of Milestone Payments. If the employer requests for sample work related to the project, you may send them through our native Messenger. You can also refer employers to specific items on your profile portfolio. After the details have been clarified and if you both agree on the payment and deadline, you will be awarded the project, which you will have 36 hours to accept. Within the 36-hour window, make sure that the terms of the project and the payment have been finalized before you accept the award. If everything is good, accept the award, and start working on the project. 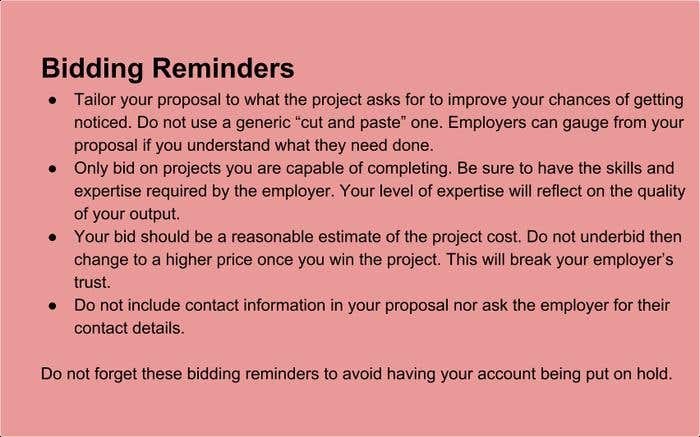 No matter what kind of project you are bidding on, a poorly-written proposal suggests lack of attention to details and poor work habits, neither of which is going to work in your favor. Make your bid proposal short but meaty. Mention your relevant experience and past work examples related to the project that you are bidding on. If the employer requests for specific details, don’t forget to include those. Ask questions to better define the scope of the project. Show that you have an understanding of what the employer needs, and that you have enough interest to pay extra attention to what the task may demand. A little self-confidence is a good thing, but over-the-top claims is not likely to impress anyone. Being honest about your skills will get you much further than a lot of hype. Proofread before you submit your proposal. Double check if you have provided all important information to the project. Review your grammar and spelling before clicking Finish. Participate in contests to showcase your skills to employers upfront. Browse for the contest that you wish to join, and make sure to read its brief. Use the Public Clarification Board on the lower part of the contest page to ask the contest holder for clarifications. Add a title and a description for your entry. Click Add Files to upload your entry. Declare whether your entry is entirely your own or if it contains any stock content. Enter its Sell Price. This is for how much the contest holder can purchase your entry in case it is not chosen as the winner. You may promote your entry by Highlighting it to make it stand out, or by Sealing it to make sure your idea is unique. The contest holder will be rating/rejecting and giving feedback to entries. Make sure to accommodate the requested revisions if you want your work to be chosen as the winning entry. Your entry will be awarded as the winner if the contest holder likes it best. Both you and the contest holder will then undergo the Contest Handover, which includes signing the Intellectual Property Transfer Agreement, to transfer the entry’s rights and to release the contest prize to you. When you accept to work on a project, we charge a small project fee relative to your bid’s value. The cost and how this fee is charged depend on the type of project you accept. Fixed-price projects. The fee is 10% of your bid or $5 USD (or equivalent in other currencies)—whichever is greater. This is charged when you accept the project. Subsequent payments made to you in excess of your bid amount will each incur a 10% project fee. Hourly projects. The fee is 10% of the payments released to you. This is charged for every payment made on the project. The winning freelancer in contests are charged 10% of the contest prize or $5 USD (or equivalent in other currencies)—whichever is greater, once the Contest Handover is completed.